Last weekend I took the plunge and cleaned out my closet(s). Just like ripping off a band aid, it stung a little at first, but now I have space for all new fall clothes. 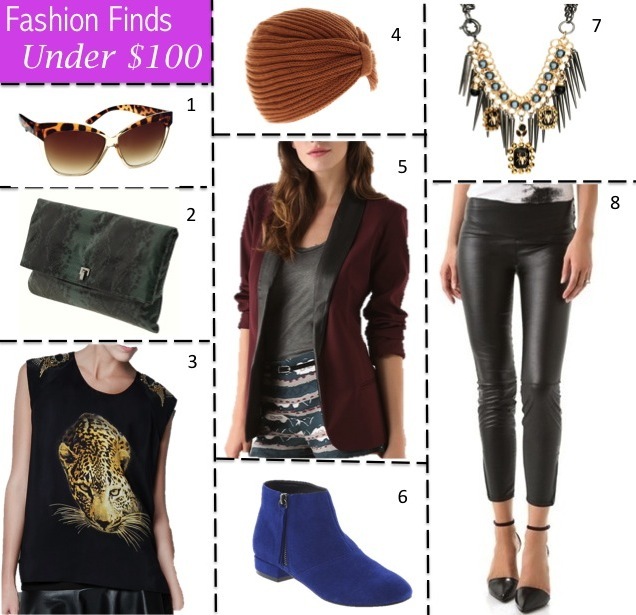 I need more than a few things, so I've been on the hunt and found clothes and accessorie under $100. Last night I pulled the trigger on this burgundy blazer (ok ok, it's $102, but still...) and as you know if you've been following for a while I'm obsessed with leather leggings. For accessories I'm looking to the streets of NYFW Spring 2013 and am gravitating towards cat eye sunglasses, oversize clutches and statement necklaces. To top it all off, I'm going to have to channel a little SJP with a funky knit turban in place of my traditional slouchy beanie. Dying for some faux leather leggings! The knit turban is really cute too! Love love love that necklace ! I need that turban! Love it! Great items. I love the necklace and the blazer! Everything is so amazing! That blazer is just gorgeous! I've already got a very similar leather collared blazer that I found on the sale rack of a tacky shop sometime last year, hehe. I can't wait to take it out again. Love leather collared jackets! I absolutely, 100% NEED those blue Chelsea booties. What an amazing find! I truly love your fashion sense! Amazing pieces! Would get the all right now! gimme those leggings!!!! I love them. p.s. gotta love those oversized clutches! In LOVE with the Zara tee!! All of these pics are amazing! Great pics Chelsea - makes me want to go shopping! That blazer is really beautiful, the black touches are perfect. cute necklace & blazer & booties! The ASOS necklace rocks my world!! Love those leather leggings!! Great price too. Thanks for sharing. Ive been on a hunt for leather leggings. I'm addicted to that blazer! i love your picks, especially the blazer! I am in LOVE with that burgundy blazer... I have the same one in black, but SO want to add the burgundy one to my closet as well! Also adore those sunnies - thought they were Elizabeth & James at first glance, such a treat to see they're ASOS!